Pop boffins have proved that there are two separate Manic Street Preachers: The gurning trio of Welsh supply teachers making propah music about library books and standing up to "the man"; and the giddy Motown fans who write life-affirming love songs for Kylie. Problem is, you never know which one you're going to get. As luck would have it, someone recently swapped Nicky Wire's gruel and water for Coco Pops and Fanta. The result, on the band's 10th studio album Postcards From A Young Man, is a gutsy burst of string-washed stadium pop rock. Best of all, the pompous common room preaching of If You Tolerate This has been replaced by a reflective, middle-aged meditation on life and longevity in the music industry. "I'm no longer preaching to the converted," croons James Dean Bradfield at one point, "that congregation has long ago deserted". The song's title? All We Make Is Entertainment. 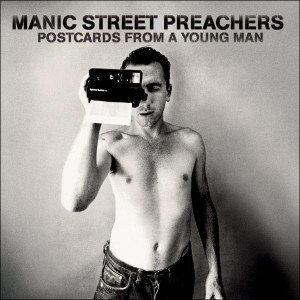 Long-term readers will know how much it pains me to say this, but the Manic Street Preachers new album isn't half bad. Especially if you're a fan of Queen. The single is out this week, and the album can be streamed on We7.